I decided a couple things for this holiday season. One - Continue celebrating the holidays on the cheap, without sacrificing anything. See how I dressed up our mantel with a few pieces of junk, clearance items and recyclables? The vintage stamp holder was a gift from my friend Kathy at Sylvia's Vintage Daughter. I added freebie glass cigar tubes to it along with a few candy canes for mere pennies. The J-O-Y stocking holders were a Target clearance item a couple years ago for just $5.00. I found this rectangle galvanized metal crate during my travels to Minnesota for Oronoco Gold Rush Days. I paid $16.00 for it and actually bought two. I filled it with varying sizes of glassware from my recycle bin in the garage that included spaghetti sauce and salsa jars. All free, of course. Gimme an A! Kathy from SVD once again came through for me. I purchased the cast aluminum letter A below from her and she in turn sent me the letter C to go with it! Rah! Rah! What a gal! The vintage snowman head was purchased at a thrift store for $2.00. It is one of my all time favorite pieces! Another glass recycled salsa jar houses more candy canes for an inexpensive festive decoration. I was thrilled to find these simple red felt stockings last year on super-duper clearance at Joann Fabrics. The detail is awesome and even appears to be trimmed by pinking shears. $1.00 each is as good as it gets, don't you think? I hope you feel I stuck to my plan of keeping the holidays cheap and simple! I'd like to share more so please check back! As always, take care and keep on junking! Sue Whitney LIVE on Gorilla Glue Facebook! Have a junk project that you're not quite sure how to complete? Well, now is your chance to receive excellent advice LIVE from one of the most well-known junk experts around! 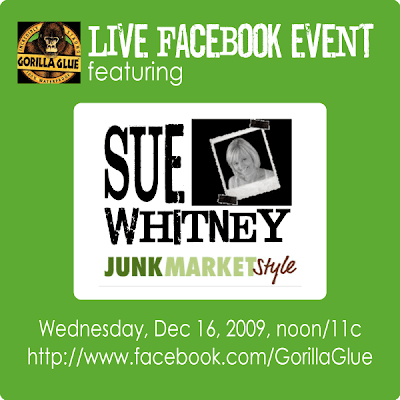 Author and President of JUNKMARKET Style, Sue Whitney, will be answering your questions on Gorilla Glue's Facebook fan page, Wednesday, December 16 at 12:00pm EST. Come join the fun and bring along your photos to share! RSVP to the event and hope to see you there! Hi all! I won't make excuses for my absence and claim how busy I've been (everybody's busy, right? ), but thought it only fair I'd share with you why I've been away. Things have finally caught up with me in my household. As some of you know, my husband is completing his MBA in addition to working full-time in his job which includes some travel. This leaves me and the girls on our own quite a bit. Let me tell you, I now have a GREAT appreciation for single parents raising their children well. Admittedly it has gotten really tough keeping up with my three children, their homework, activities, house cleaning, disciplining... well, just parenting. It's especially rough when you do not have much (any) extended family support. Sooooo, after reviewing everything that needed to be done in my day, I decided to take a break from blogging and posting online much. My house is slowly being put back in order, my girls are happy to have more fun with mom, and I'm feeling much better about things. Best of all...hubs graduates in about 12 weeks! Woot! I am hoping to get back in the swing of things with some junk projects so stay tuned! enjoying a wonderful Thanksgiving feast that was prepared by the hotel staff! The girls enjoyed their free-to-decorate-how-they'd-like candy-themed Christmas tree. They did a beautiful job! And we baked sweets for the holidays including chocolate chip bars, jumbles, hundreds and thousands, bark and Hollywood Squares. Thank you to those that visited my blog and continued to follow during my absence. I am really looking forward to catching up with all of you as well as spend time with my family. Love to you all!